Brentford's Richard Lee starred in a penalty shoot-out as his side reached the Johnstone's Paint Trophy southern area final at the expense of Charlton. The Bees, who will now play Exeter over two legs, hit the bar through Karleigh Osborne while Charlie MacDonald fired wide when well placed. Lee made himself the hero by saving three successive penalties from Johnnie Jackson, Therry Racon and Kyel Reid. That left Gary Alexander to convert the winner and send his side through. 94:50 Penalty scored by Gary Alexander. 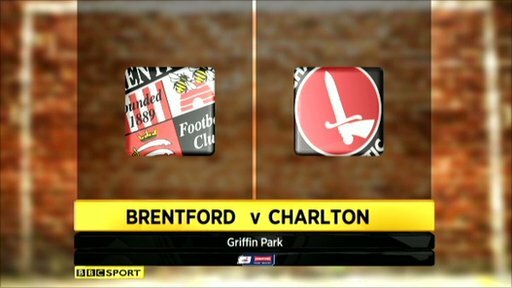 Brentford 3-1 Charlton on penalties. 94:12 Penalty scored by Gary Doherty. Brentford 2-1 Charlton on penalties. 93:34 A save by Rob Elliot from penalty by Michael Spillane. 92:49 Penalty taken by Kyel Reid saved by Richard Lee. 92:16 Charlie MacDonald scores a penalty. Brentford 2-0 Charlton on penalties. 91:24 A save by Richard Lee from penalty by Therry Racon. 91:01 Penalty scored by Kevin O'Connor. Brentford 1-0 Charlton on penalties. 90:25 Power penalty taken by Johnnie Jackson saved by Richard Lee. 90:00+9:30 The players are ready for the drama of the penalty shoot-out. 90:00+4:26 The referee brings to match to an end, it's all square and we move straight to a penalty shoot-out to decide the winners. 90:00+3:41 Shot by Sam Wood from deep inside the penalty area misses to the right of the target. 90:00+2:55 The assistant referee flags for offside against Kyel Reid. Richard Lee takes the indirect free kick. 90:00+2:36 Free kick awarded for a foul by Kevin O'Connor on Therry Racon. Therry Racon takes the direct free kick. 90:00+1:36 Charlie MacDonald produces a right-footed shot from the edge of the box and misses to the right of the goal. 89:01 Free kick awarded for an unfair challenge on Therry Racon by Toumani Diagouraga. Rob Elliot takes the direct free kick. 88:29 Gary Alexander fouled by Carl Jenkinson, the ref awards a free kick. Craig Woodman takes the free kick. 86:36 The referee blows for offside. Richard Lee restarts play with the free kick. 84:12 Unfair challenge on Michael Spillane by Matt Fry results in a free kick. Centre by Craig Woodman, Shot by Karleigh Osborne. 82:36 Gary Doherty gives away a free kick for an unfair challenge on Gary Alexander. Craig Woodman delivers the ball from the free kick left-footed from left channel, clearance made by Carl Jenkinson. 81:53 Inswinging corner taken by Johnnie Jackson from the right by-line played to the near post, Christian Dailly produces a header from deep inside the six-yard box which goes wide of the right-hand upright. 81:36 Therry Racon takes a shot. Save made by Richard Lee. 80:39 The referee penalises Joe Anyinsah for handball. Direct free kick taken by Richard Lee. 80:21 Kyel Reid takes a shot. Blocked by Stephen Wright. 79:17 Substitution Pawel Abbott goes off and Paul Benson comes on. 79:17 Substitution (Brentford) makes a substitution, with Michael Spillane coming on for Robbie Simpson. 76:05 Unfair challenge on Gary Alexander by Christian Dailly results in a free kick. Craig Woodman crosses the ball from the free kick left-footed from right channel. 73:02 Foul by Leon Legge on Joe Anyinsah, free kick awarded. Johnnie Jackson has an effort direct from the free kick, blocked by Toumani Diagouraga. Matt Fry takes a shot from just outside the penalty area which clears the crossbar. 72:04 Foul by Gary Alexander on Jose Vitor Semedo, free kick awarded. Christian Dailly takes the direct free kick. 70:15 Free kick awarded for an unfair challenge on Toumani Diagouraga by Kyel Reid. Richard Lee takes the free kick. 70:15 Substitution Alan McCormack leaves the field to be replaced by Johnnie Jackson. 70:15 Substitution (Charlton) makes a substitution, with Joe Anyinsah coming on for Lee Martin. 66:06 Headed effort from deep inside the penalty area by Lee Martin goes harmlessly over the crossbar. 64:59 Robbie Simpson handles the ball and concedes a free kick. Rob Elliot takes the direct free kick. 64:13 Free kick awarded for a foul by Carl Jenkinson on Robbie Simpson. Craig Woodman restarts play with the free kick. 64:13 Substitution (Brentford) makes a substitution, with Sam Wood coming on for Marcus Bean. 62:34 Corner taken right-footed by Kevin O'Connor from the right by-line, Alan McCormack makes a clearance. 60:38 Charlie MacDonald takes a shot. Save made by Rob Elliot. 60:03 Free kick awarded for an unfair challenge on Charlie MacDonald by Gary Doherty. Craig Woodman takes the direct free kick. 58:44 Booking Kevin O'Connor receives a yellow card for unsporting behaviour. 54:34 Kyel Reid fouled by Marcus Bean, the ref awards a free kick. The free kick is delivered right-footed by Lee Martin from left channel, clearance made by Toumani Diagouraga. 54:34 Booking Marcus Bean goes into the referee's book. 53:57 Corner taken right-footed by Kevin O'Connor from the right by-line, Jose Vitor Semedo makes a clearance. 52:14 Shot from outside the box by Robbie Simpson misses to the left of the target. 51:21 Free kick awarded for an unfair challenge on Craig Woodman by Lee Martin. Richard Lee takes the free kick. 45:36 Gary Alexander takes a shot. Clearance by Christian Dailly. 45:00+2:24 The referee blows for half time. 45:00+2:02 Corner taken by Lee Martin from the left by-line. 42:07 Craig Woodman concedes a free kick for a foul on Pawel Abbott. Free kick taken by Rob Elliot. 40:35 Alan McCormack challenges Toumani Diagouraga unfairly and gives away a free kick. Craig Woodman crosses the ball from the free kick left-footed from left channel. 38:21 Gary Alexander gives away a free kick for an unfair challenge on Carl Jenkinson. Free kick crossed left-footed by Kyel Reid, Toumani Diagouraga manages to make a clearance. 37:13 Craig Woodman challenges Lee Martin unfairly and gives away a free kick. The free kick is swung in left-footed by Kyel Reid. 33:46 Free kick awarded for a foul by Pawel Abbott on Leon Legge. Richard Lee takes the direct free kick. 33:09 Kyel Reid takes a shot. Save by Richard Lee. Kyel Reid takes a shot. Blocked by Leon Legge. 32:10 Pawel Abbott is adjudged to have handled the ball. Richard Lee restarts play with the free kick. 32:10 Booking Booking for Pawel Abbott for unsporting behaviour. 28:23 Marcus Bean fouled by Therry Racon, the ref awards a free kick. Richard Lee restarts play with the free kick. 27:11 Lee Martin is ruled offside. Richard Lee takes the indirect free kick. 25:50 Marcus Bean challenges Therry Racon unfairly and gives away a free kick. Lee Martin delivers the ball from the free kick right-footed from left channel, Richard Lee makes a save. 24:30 The official flags Lee Martin offside. Richard Lee takes the indirect free kick. 22:50 Toumani Diagouraga takes a shot. Blocked by Gary Doherty. 22:09 Pawel Abbott is penalised for handball and concedes a free kick. Free kick taken by Karleigh Osborne. 21:22 The assistant referee signals for offside against Kyel Reid. Richard Lee restarts play with the free kick. 21:07 Robbie Simpson takes a shot. Gary Doherty gets a block in. 20:00 Corner taken right-footed by Kevin O'Connor from the left by-line, Alan McCormack manages to make a clearance. 18:34 Christian Dailly concedes a free kick for a foul on Charlie MacDonald. Robbie Simpson shoots direct from the free kick, save made by Rob Elliot. 17:30 Gary Alexander has a header from inside the six-yard box and clears the crossbar. 10:52 Unfair challenge on Christian Dailly by Charlie MacDonald results in a free kick. Rob Elliot takes the free kick. 10:21 Shot from close range by Pawel Abbott misses to the left of the target. 9:41 The offside flag is raised against Robbie Simpson. Free kick taken by Rob Elliot. 5:56 Corner taken by Kevin O'Connor, clearance by Jose Vitor Semedo. 3:28 Free kick awarded for an unfair challenge on Kyel Reid by Stephen Wright. Matt Fry restarts play with the free kick. 3:28 Booking Caution for Stephen Wright. 0:22 Jose Vitor Semedo concedes a free kick for a foul on Charlie MacDonald. Direct free kick taken by Richard Lee.